Man Returns Gold Earrings After Three Years And It's Amazing To See How Humanity Still Prevails! 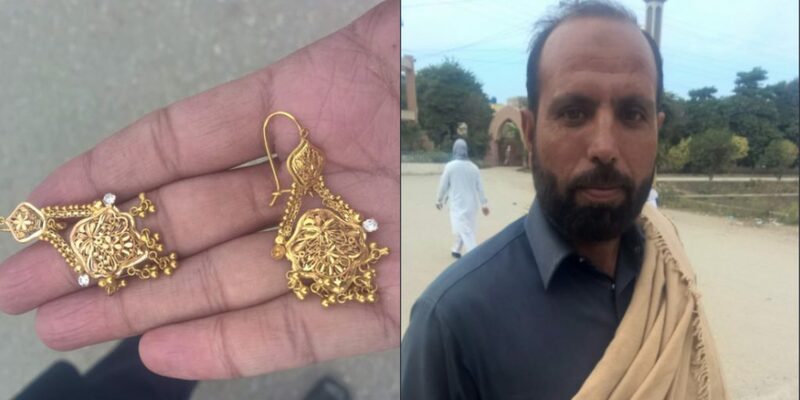 Man Returns Gold Earrings After Three Years And It’s Amazing To See How Humanity Still Prevails! Although the rise of technological advancement has given a spur to materialism, there are people who value religious morals and humanity more than anything. It is hard to find such people in today’s world; where everyone is after money. Around the globe, humanity is not prioritized but materialism. Check out this post below! A tweet flabergasted many on Twitter saying, that a man returned gold after three years. A guy tweeted that how a labor knocked their house and returned a pair of earring they had lost, back in 2015. In the era of greed, not many are inclined to return such precious things to the real owners. Offered him money. He refused. Kept the money forcefully in his pocket but he returned it back with the same enthusiasm and said, "I'll wait for the God's reward". It is pertinent to mention that the guy who returned the earing was a labor, who strive to earn daily bread and butter. When the owner offered him money as a reward he gave it back saying, “I will wait for the God’s Reward.” Indeed, Allah will reward those who believe him and acts in the right manner. On the same tweet, people around the world replied that how they also got back their stuff after losing it. A Hindu guy tweeted that how he got back his phone twice in Dubai by Pashtuns. In addition, another man narrates that how he forgot his cell phone in a taxi during Hajj 2017 and the driver returned the phone. The paid 100 riyals as a reward to the driver. Another fellow wrote that how he forgot RS. 2000 back in 1982 in his shirt and the washerman returned it to him. Once the washerman/Dhobi in my college hostel had given Rs 2000 back to me that I had accidentally left in my pocket of the shirt I had given him for washing. Rs2000 was a serious amount in 1982. A healthy society is the one where people are driven by humanity and not by materialism. Pakistan, despite having a plethora of social problems and denizens with negativity, there are people who truly follow the way of Islam and contribute to construct a healthy society. This man should come in the limelight, so he could get what he deserves. The government must acknowledge the efforts of all such noble souls and should recompense them accordingly. They are the real assets of Pakistan who even in poverty do not greed for money. 180 million salute to this honest & most respected citizen of Pakistan. Ppl should make some financial contribution for his family. Send me some address to send 10,000 RS. Wah. The MAN. The man of character and integrity. To sum up, there is no alternate to integrity, honesty, and generosity. No power in the world, except Allah, can reward people of character. Truly, money can’t buy integrity and honest.